Jakob Dylan On Mountain Stage Dylan visits West Virginia with Three Legs, the rootsy ensemble featuring Neko Case and Kelly Hogan. The band plays songs from Dylan's sophomore solo release, the T-Bone Burnett-produced Women & Country. 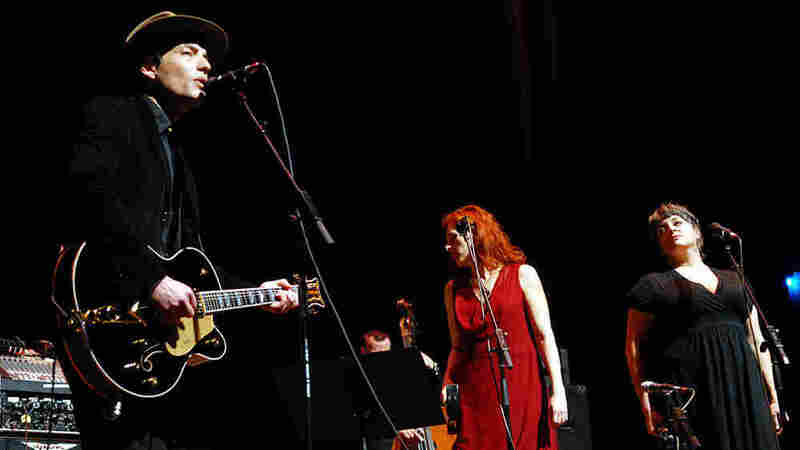 Jakob Dylan, Neko Case, Kelly Hogan performed on Mountain Stage. "Nothing But the Whole Wide World"
"Smile When You Call Me That"
"We Don't Live Here Anymore"
"Down on Our Own Shield"
For his second appearance on Mountain Stage, Jakob Dylan is backed by Three Legs, his rootsy ensemble featuring vocalists Neko Case and Kelly Hogan. Joining Dylan to perform songs from his second solo record Women & Country are guitarist Paul Rigby, pedal steel guitarist Jon Rauhouse, bassist Tom Ray and drummer Barry Mirochnick. Women & Country was produced by T-Bone Burnett — the same man who helmed the boards for Bringing Down the Horse, the massively successful release by Dylan's band The Wallflowers. The band tours Ireland and the UK in July before returning for several festival stops across North America.